seiji morimoto tokyo 1971, musicology kunitachi college of music, electronic pieces john cage sound performances, installations,videos. 2003berlin,international festivals uncertain acoustic appearances usual objects,water stones, tech medium. 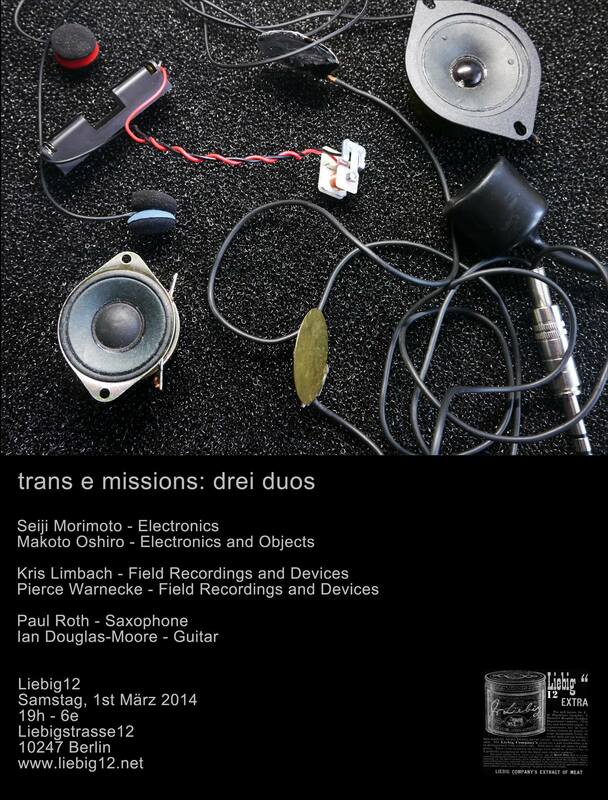 with takehisa kosugi, keitetsu murai, olivier di placido, francesco cavaliere, olaf hochherz, rius van alebeek, ignaz schick, luciano maggiore, crys cole, felicity mangan, alessandra eramo, nicolas wiese, kakawaka, seijiro murayama, jamie drouin, hannes lingens, johnny chang, katsura yamauchi and many others. makoto oshiro performer installation artist tokyo, japan. sound, other elements light, electricity movement objects. live performances, self-made tools instruments electronic devices, every day materials junk. sound physical auditory phenomena, interlocks / interferes & mediums. kris lim­bach’s sound ap­p­lied physics film- edit­ing tech­ni­ques film sound aest­he­tics “be­gin_ if _ ()” pro­ject (upcoming release of begin _if_ (3) at agxivatein in spring) live per­for­man­ces. mo­dis­ti, frame­work radio and more. to­ge­ther with pierce war­ne­cke the emit­ter micro fes­ti­val and label. pierce warnecke is a sound and video berklee college of music meisterschüler studies udk kunst und medien. audiovisual installations, performances pieces emitter micro festival and label with kris limbach. kw institut, leap, feed, harvestworks (ny), luggage store gallery (sf), berklee (boston), calarts (la) festivals zero1 biennale, transmediale vorspiele, bozart/beaf (brussels), madeiradig, nuits sonores, boston cyberarts, visionsonic, pixelache, vidéoformes, sxsw interactive and more khalija, staaltape, gaffer records, attenuation circuit gruenrekorder. mediumloud noise music for saxophone/guitar. soundwalls that process textural distortions, microtonal manipulations, and other sound curiosities.